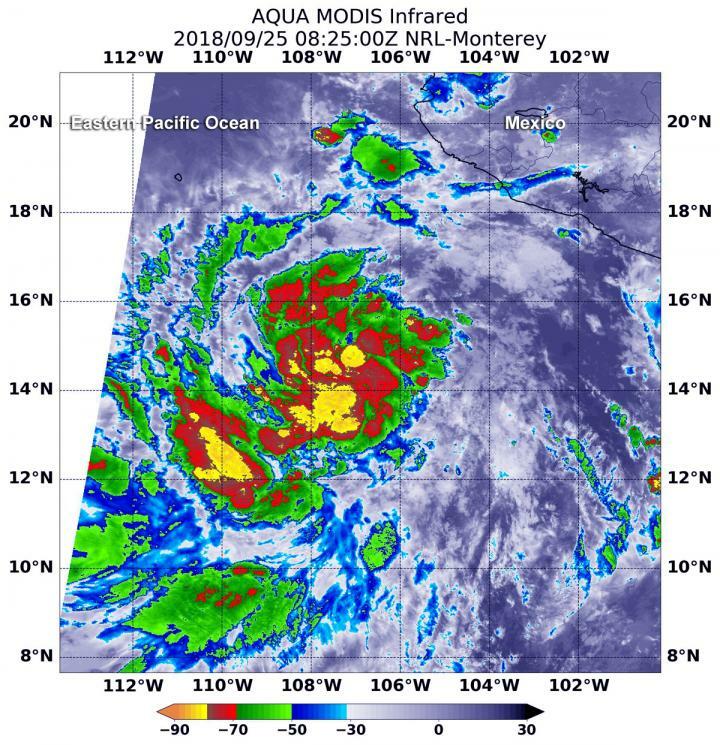 NASA's Aqua satellite passed over the Eastern Pacific early on Sept. 25 when Rosa was still a tropical depression called 20E. Infrared satellite data taken at 4:25 a.m. EDT (0825 UTC) on Sept. 25 from the Moderate Resolution Imaging Spectroradiometer or MODIS instrument aboard NASA's Aqua satellite revealed strongest storms with the coldest cloud top temperatures around 20E's center and in a band of thunderstorms southwest of center. MODIS data showed that the tropical cyclone's cloud pattern has become better organized, with developing convective banding features and the depression was upgraded to a tropical storm. At 9 a.m. EDT (1200 UTC), the center of Tropical Strom Rosa was located near latitude 14.7 degrees north, longitude 108.0 degrees west. That's about 385 miles (620 km) south-southwest of Manzanillo Mexico, so there are no coastal watches or warnings in effect. The depression is moving toward the west-northwest near 9 mph (15 kph). A west to west-northwest motion at a similar forward speed is expected during the next few days. Maximum sustained winds are near 45 mph (75 kph) with higher gusts.